Many experienced wedding businesses have sales rituals and strategies that have worked for them for years. They say the same things and present samples or images of their offerings that they know will resonate well with their clients. However, using a computer and the power of technology and the Internet can be an amazing boost to closing sales. Many wedding business owners may not be the actual person that performs the service or they may be an owner/operator that does not want to provide their service for every wedding they book. Thus they have staff or independent contractors working for them so they can do more than one wedding a day and not be burdened individually as the only option. 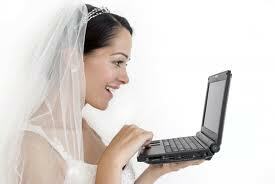 Every magazine or wedding planning website instructs the bride to meet the actual person that will perform the service. Sometimes it is not feasible for that individual to be on hand for the sales presentation. The salesperson can try to sell the bride and groom that there is no need to see the actual person that will be performing the service, or they can arrange to see them at a later date, however more often than not, a sale that can be closed will be delayed and may never end up happening. Easy virtual solution: Try to arrange for the bride and groom to have a web conference with the person who will be performing the service. A phone call might suffice but think about how much more a video conference could enhance the process because they are able to see that person face-to-face; it fortifies the interest established from seeing samples or a video of that person’s work or performing. Doing this puts you in a position to close the sale on the spot. Online review site tour: Another way to use your computer is to take the bride and groom on different review sites to see your profile. Seeing objective reviews outside of your website will help build a lot of confidence. Make sure you are proactive in getting your clients to review you. You are better off having a balanced amount of reviews on numerous sites like WeddingWire, The Knot, Google, Yahoo and Yelp than having the majority of your reviews on one platform. Technology has changed the way business is done today and is shaping the way it will be done in the future. It has created an endless number of opportunities and tools for closing sales, so you might as well take advantage of them.